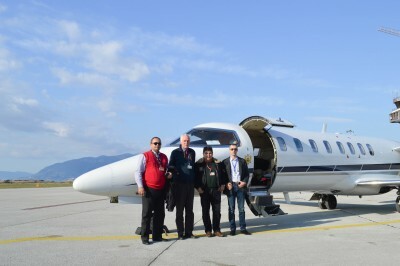 Last 11th November the Montenegro Civil Aviation Authority (CAA) demonstrated the technical feasibility for implementing a Localizer Performance (LP) approach to Tivat airport. Flight trials were performed using a Bombardier Learjet 45. Tivat airport is located next to the sea but surrounded by high hills which discourage the implementation of straight-in approach procedures. Furthermore night operations are not allowed either. In order to overcome these situations, Pildo Labs in coordination with the Montenegro CAA, has designed an LP approach with a final offset track of 15 degrees with the runway centreline. The procedure, successfully tested, allows the reduction of the approach minimums by more than 200ft with respect to the current Localizer approach. “The procedure was easier to fly than expected, once reaching the minimums the airplane was far from the obstacles” mentioned Dragan Popovic, chief pilot involved in the flight trials. Once approved, it is expected that the implementation of this new procedure will mark a turning point towards the acceptance of night operations at the airport. These flight trials were performed under the CabilAvi Project, part of the European Union’s programme for research and innovation, H2020, managed by the GSA. The CabilAvi project aims at enhancing the capacity of aviation stakeholders within the entire EGNOS coverage zone.